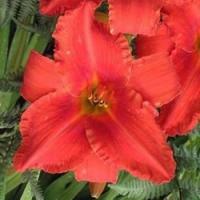 Perennial Daylilies (Hemerocallis) come in a variety of sizes and provide a wide range of wonderful colors. Their name Hemerocallis translates from the Greek language and signifies beauty for a day, and hence we get the word 'daylily', due to the fact that each flower only lasts for 1 day. These perennial flowers differ from lilies as they are not grown from true bulbs. The genus is made up of around 20 different species, and there are many hundreds of named varieties. In fact there are now so many varieties of daylilies exhibiting colors of orange, yellow, pink, purple, near white and a lot of other combinations. Every year more and more daylilies are being hybridized so combinations of this plant keep on growing. These plants are so adaptable that they will thrive under virtually all environments with the exception of heavy, water logged soils. They perform best in soil that is rich and moist, flowering more abundantly in a sunny area, however they will tolerate a considerable amount of shade. Every part of the daylily is edible although the flowers are most frequently used. Flower buds may be cooked and are said by many people to taste something like green beans, whilst the tasy flower petals can be used in salads. Butterflies absolutely adore these flowers. These eye-catching flowers are rich with nectar and act as magnets for butterflies. Daylilies bloom during the summer time. With a typical stem of flowers blooming from between 1 week to 1 ½ months. They work really well in the perennial flower border, for massing, and groundcover on slopes, as they will form a dense mat in just a few years. At the begining of spring all dead foliage should be removed before the plant begins to green up. The 'Alabama Jubilee' provides impressive 7" flowers which are fluorescent red-orange with a brighter red halo and greenish throat. This outstanding flower is a marvellous grower with healthy pest resistant foliage and sturdy scapes with over 25 buds each. The blooms appear in early to mid-season and put on a stunning show for upwards of four weeks. Amazing bloom power and distinctive color make 'Alabama Jubilee' a real head turner. Vigorous and prolific, 'Alabama Jubilee' takes winter cold in the north and summer sun in the south. 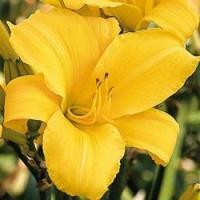 Daylilies are among the easiest plants to grow, and are a good option for any garden enthusiast. They will grow in virtually any soil conditions. They can be used for stand alone plantings, edging, in borders or in mixed containers and tubs, and when planted together in large numbers, they quickly crowd out weeds and make a carefree and colorful ground cover. Buttered Popcorn has fragrant buttery yellow 6" flowers that bloom profusely in mid-summer on well branched scapes. This tetraploid cultivar is well known for its incredible rebloom through fall and just “pops” with color. In southern zones 'Buttered Popcorn' is said to be an even better rebloomer than the very popular 'Stella de Oro' and an excellent choice for an extended period of bloom, healthy foliage, and fragrant flowers. They will grow in almost any soil and handle drought to wet soil conditions. Use for stand alone plantings, edging, in borders or in mixed containers and tubs. Planted together in large numbers, they quickly crowd out weeds and make a carefree and colorful ground cover. They can survive many harsh conditions that other plants cannot including: polluted city environments, slopes, poor and dry soils, near pavement that is salted in winter, and under Black Walnut trees (not affected by juglone).